Obituary – Kaiser, Margaret Irene (Dolezal) « Perry High School Alumni Association, Inc.
– daughter of Mr. and Mrs. Frank Dolezal of near Perry, will graduate as the student having the highest attendance record in the class. She was in the Senior Play and was a member of the Red Hots. She was born in Buhl, Idaho, and came to Perry before she was of school age. She like many others is a swing fan and likes all kinds of sports. She is undecided as to the future. Former Perry resident, Margaret Kaiser, 63, Stillwater, died at 6:20 a.m. Sunday at Stillwater Medical center following a lengthy illness. Funeral mass will be at 10 a.m. Tuesday at St. Rose of Lima Catholic church at Perry under direction of Rev. Ward J. Pankratz, the church pastor. Burial will be at the Catholic cemetery at Perry under direction of Brown Funeral home of Perry. Casket bearers will be sons and sons-in-law of the deceased. Mrs. Kaiser was the daughter of Frank and Victoria Dolezal and was born Oct. 8, 1922, at Buhl, Idaho. She moved with her family to the Perry community when she was six months old. She was a 1939 graduate of Perry high school and attended Draughon’s school of business in Oklahoma City. 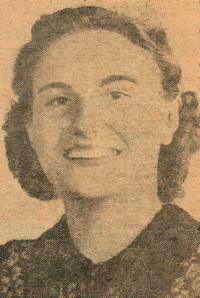 She and Raymond Kaiser were married April 24, 1944, at Denver, Colo. Mrs. Kaiser worked as an executive secretary for a number of years and most recently had been employed in the foreign language department at Oklahoma State university and the department of vocational technical education. She was a member of the Catholic church. In addition to her husband, Mrs. Kaiser was preceded in death by her mother and one daughter. Survivors include seven sons, Michael Kaiser, Sand Springs, Joe Kaiser, William Kaiser, Gerald Kaiser, James Kaiser and John Kaiser, all of Stillwater; and Patrick Kaiser, Ponca City; two daughters, Mrs. Howard (Victoria) Gault and Mrs. Hal (Mary) McCulley, both of Ponca City; her father, Frank Dolezal, Stillwater; one sister, Dorothy Childress, Stillwater; two brothers, Robert Dolezal, Lake Jackson, Texas; and Richard Dolezal, Longview, Texas; and 16 grandchildren.